Rob Emerson vs. Nik Lentz targeted for "UFC Fight Night 21: Florian vs. Gomi"
A lightweight contest pitting Rob Emerson (9-8 MMA, 3-2-1 UFC) against Nik Lentz (17-3-2 MMA, 1-0-1 UFC) is targeted for UFC Fight Night 21, MMAjunkie.com (www.mmajunkie.com) has learned from sources close to the situation. Though bout agreements have yet to be signed, both fighters have agreed to the fight and are expected to put pen to paper shortly. UFC Fight Night 21 takes place March 31 at Bojangles Coliseum in Charlotte, N.C. The main card airs live on Spike TV and serves as the lead-in for "The Ultimate Fighter 11." The addition brings the event's total number of bouts to 11, a robust card for the promotion's fourth trip to North Carolina. A lightweight showdown between two-time contender Kenny Florian and heavy-handed Japanese import Takanori Gomi headlines. Lentz was behind on the scorecards in his most recent octagon appearance against Thiago Tavares at UFC Fight Night 20, but a deduction to the Brazilian for an inadvertent groin kick in the final frame left the fight as a majority draw. It was a disappointing result for Lentz, a product of the Minnesota Martial Arts Academy, as he had earned seven-straight win over a near-two-year period since his most recent blemish, which, ironically enough, was a draw against WEC veteran Kyle Jensen. Lentz made a successful octagon debut this past September at UFC 103, where he defeated Rafaello Oliveira by decision. Emerson, meanwhile, got back on the winning track earlier this month when he defeated "The Ultimate Fighter 8" finalist Phillipe Nover at UFC 109. A cast member of "The Ultimate Fighter 5," Emerson fell short against Kurt Pellegrino and Rafael dos Anjos at UFC Fight Night 17 and UFC 103, respectively, and vowed to re-tool his training regimen prior to his meeting with Nover. To that end, Emerson migrated to Hilo, Hawaii, to train with B.J. Penn in addition to his work in Huntington Beach, Calif., and said the experience helped him harness the mental aspects of fighting. The placement of Emerson vs. Lentz in UFC Fight Night 21's current lineup is unknown at this time. Arona Recovering, Hoping to Fight in U.S.
As the world watched the terrible news of another horrific earthquake -- this one epicentered in central Chile, and waited for news of a follow-up tsunami expected to hit Hawaii, UFC lightweight champion BJ Penn and his website BJPenn.com became a legitimate news outlet for information. Penn, who incorporates frequent video blogs as part of his website, live streamed video footage of Hilo Bay on his website throughout the day. His videos were picked up by CNN and Fox News and broadcast to a worldwide viewing audience, and Penn was also interviewed by CNN regarding conditions in his area. Though the tsunami was first expected to hit at 11 am local time, the islands had not suffered any damage as of one hour later, though there were reports of receding shorelines, an early sign of an impending tsunami strike. The 31-year-old Penn -- a two-time UFC champion in two different weight classes -- lives in Hilo and is considered one of Hawaii's most famous athletes. He's always been among the more tech-savvy athletes in MMA, promoting his website in interviews dating back to his early days in the UFC. He recently released an iPhone app that was a bestseller, and just a few days ago launched what he calls the "Penn Global Broadcasting Network" on his site, offering 90 channels of content. "It's the biggest news in the world and it's coming from our iPhones," a member of Penn's entourage could be heard saying while shooting video of the bay. Created by the "massive" 8.8-magnitude earthquake earlier today in Chile: Damn, I'd be scared if I was in BJ's position. Let's hope nothing happens. **After you watch the first vid, there are 4 or 5 more under it. PROJECTED TO HIT 4:30ET/2:30MT They are going to broadcast live in about 20 minutes. Crazy. Twitter can be a wonderful or damn annoying thing. In fact, it’s just like the internet; at times providing unfettered access to vitally important knowledge, or an opportunity for morons to drone on incessantly about sh-t they know nothing about. Like anyone gives an eff (hey wait a sec…). This time around Twitter has blessed us all, as both Quinton “Rampage” Jackson and Rashad Evans have confirmed the date of their upcoming bout, before the official word came down. While the UFC took a week off from conducting an event, matchmaker Joe Silva didn't get to enjoy the vacation. According to The Wrestling Observer Spencer Fisher has been forced to withdraw from the UFC's upcoming debut on the Versus network. And in an additional report from MMAWeekly.com, Fisher's original opponent, Duane "Bang" Ludwig (19-10 MMA, 2-1 UFC) will now face UFC newcomer Darren Elkins (9-1 MMA, 0-0 UFC). Spencer Fisher has been forced out of the upcoming UFC on Versus 1 card in March due to an undisclosed injury. Octagon newcomer Darren Elkins has been tapped as a replacement to face hometown fighter Duane "Bang" Ludwig on the Denver-area card. 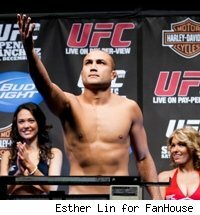 The change of opponents was confirmed to MMAWeekly.com by sources close to the fight on Friday. The injury to Fisher was first reported by F4Wonline.com. The body count rises once again-the curse's second victim today is Rob Kimmons. He's now off the upcoming UFC event on Versus with what's believed to be a leg injury. He was to have faced Mike Pierce. Julio Paulino (17-3) will make his UFC debut as the replacement. Former Olympian Rick Hawn (5-0) reached a conclusion that's well-known to many international competitors: you can't eat gold medals. With that in mind, the 33-year-old Hawn, who faces Tom Gallicchio tonight in the main event of World Championship Fighting 9 in Wilmington, Mass., scrambled to fulfill a long-held dream of fighting in mixed martial arts and competed in his first fight within six months of picking up a four-ounce glove. Although initially expected to fight Pat Barry (5-1 MMA, 2-1 UFC), heavyweight Gilbert Yvel (36-14-1 MMA, 0-1 UFC) instead will fight Ben Rothwell (30-7 MMA, 0-1 UFC) in June at UFC 115. Sources close to the event today confirmed the change with MMAjunkie.com (www.mmajunkie.com) and said verbal agreements are in place for the bout. UFC 115 is expected to take place June 12 at GM Place in Vancouver, British Columbia. The night's main card airs on pay-per-view. With Barry no longer facing Yvel, Barry vs. Mirko "Cro Cop" Filipovic is expected for UFC 115. A pair of heavyweight strikers collide in June at UFC 115 now that Mirko "Cro Cop" Filipovic (26-7-2 MMA, 3-3 UFC) and Pat Barry (5-1 MMA, 2-1 UFC) have agreed to a matchup. Sources close to the event today told MMAjunkie.com (www.mmajunkie.com) bout agreement should be distributed shortly and that the competitors were told it'll be part of the night's pay-per-view main card. MMAScrapsRadio.com first reported the fight earlier today. Barry initially was expected to fight Gilbert Yvel (36-14-1 MMA, 0-1 UFC) at the June 12 event. Although not officially announced by the UFC, UFC 115 takes at GM Place in Vancouver, British Columbia, Canada. The curse just won't quit. The latest victim today is Cole Miller, who has an injury and now can't fight Andre Winner at UFC Fight Night 21. As a result, the fight is off. It's not known if they'll try to reschedule at a later date, but they won't try and find a replacement for Winner. Apparently "personal reasons" was not the reason Paulo Filho no-showed Bittetti Combat 6 last night, where he was scheduled to face Yuki Sasaki. He told the TATAME website that it was all about the almighty dollar. "We didn’t have a financial agreement. The purse was too low comparing from what I’m used to receiving and it’s bad for the fighter’s career. [The media] said I’m having problems with drugs and medicines … You can test me and you’ll see … I’m great. I’m not worried with fighting in Brazil anymore. I like the event, Amaury is my friend, but this event doesn’t pay what I deserve ... If someone pays what I deserve, It’ll be my pleasure to beat him up". Fedor Emelianenko's manager says his fighter will only face Strikeforce champion Alistair Overeem after Overeem proves he isn't taking performance enhancers commonly banned from competition. Overeem has said he wants to face Emelianenko this year. But Overeem first has to pass drug tests adminstered by a third party, Emelianenko's manager, Apy Echtfeld, told mixfight.nl, a Dutch site about mixed martial arts. Strikeforce CEO Scott Coker on Thursday confirmed recent speculation that his fight promotion would land in Nashville, Tenn., on April 17. Aside from the date and location, he was rather elusive. No fights were revealed despite expectations of SF Middleweight Champion Jake Shields vs. Dan Henderson for the title on the event, but there was confirmation of no Fedor Emelianenko on the event-he's rumored to face Fabricio Werdum in May. Also no word on TV for the April event but it's expected to be CBS, although it could wind up being Showtime. Joe Brammer (7-1-1 MMA, 0-1 UFC) makes a second attempt at his first Ultimate Fighting Championship victory at UFC 114, where he's likely to meet veteran Aaron Riley (28-12-1 MMA, 2-4 UFC). Both lightweights have agreed to the fight and are expected to sign shortly, a source close to one of the fighters told MMAjunkie.com (www.mmajunkie.com). UFC 114 takes place May 29 at the MGM Grand Garden Arena in Las Vegas. The night's main card airs on pay-per-view, though Brammer vs. Riley is likely to be part of the night's un-aired preliminary card. Brammer entered the UFC last year with an undefeated 7-0-1 record, which included a reign as a champion of the Iowa-based Midwest Cage Championship. However, he suffered his first career loss at The Ultimate Fighter 10 Finale in December when he was tagged with a submission loss to ground wizard Mark Bocek. Brammer faces his most experienced opponent yet when he meets Riley, a 13-year vet currently in his third stint with the UFC. Riley went 0-2 during his previous two UFC runs, but since his return in late 2008, he's 2-2 with decision wins over Jorge Gurgel and Shane Nelson. But even Riley's two recent losses (which are the only ones in his past six fights) come with a disclaimer. The first came to Nelson after what appeared to be a premature referee's stoppage, after which Riley immediately sprang to his feet to protest. (Riley avenged the loss five months later). And though he was suffering damage in a UFC 105 fight with Ross Pearson, the bout was stopped because of Riley's gushing bloody nose and not because he was knocked out.